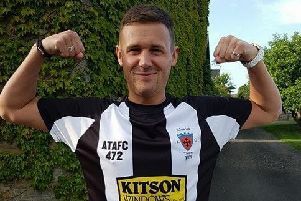 Dan Herron’s Rothbury returned to the summit of the Northern Alliance Division 2 after overcoming an extremely tough test on the Border. 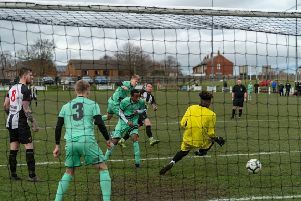 Gareth McCann cancelled out Tom McPherson’s early own goal before the Reds found themselves profiting from a freakish goal of their own - Ewan Sherry’s routine clearance somehow ending up nestled in the Rovers net late on. Scott Mitchell’s Spittal played on the front foot from the off with Kyle Jeffrey finding acres of space down the left. Linking up well with full back Leigh Walker, he was unfortunate not to find Paul Wood after dropping his shoulder to pass visiting defender Michael Old. Another venture in field then saw a strike hit the side netting, but after a poor goal kick was pounced on by a very aware Marco Lambert, Jeffrey was set away once again and at the third attempt, a dangerously fizzed ball across the 6 yard line caused panic in the Rothbury ranks, skipper McPherson deflecting the ball past a sprawling Dominic McMahon for the opener. Richard Baxendale then intercepted a ball forward only to drag his shot wide and Jeffrey again went close, delivering a low ball across goal which clipped McMahon’s far post on it’s way through. It was certainly not one way traffic and for every black & white surge forward, the gold of Rothbury equalled them going in the other direction. Greg Woodburn was the first to go close, bravely attacking McPherson’s inswinging set piece before the influential Tony Brown then played in McCann with a lovely threaded pass. With Baxendale committed McCann opted to go alone - Ben Fairbairn ushering him away from goal leaving strike partner Daniel Thompson bemused as he stood open in a far better position. With boots and studs thundering towards him, Michael Beveridge then made a fantastic save down low from James Loughborough’s cross and also gathered well from a dangerous move down the other flank - Michael Old setting up Thompson for a half chance on the turn. Their persistence paid off eventually when McCann gambled on a loose, bouncing ball to then lift his effort over the onrushing Beveridge and in. Towards half-time, both Baxendale and Niall Jones went close to Lambert’s diagonal free kick with the latter then creating a chance from nothing having weaved his way through traffic out wide - James Jackson hooking the ball to safety with Dmitrijs Paplavskis in close proximity. Proceedings did not differ any in the second half with the game very open - both sides creating dangerous situations for one another. Ben Fairbairn nodded away a nicely weighted ball forward from Brown with Loughborough breathing down his neck and a ferocious McMahon strike was held well by Beveridge - Thompson’s eyes lighting up at the thought of a spillage. McCann then went for an audacious lob that sailed over the crossbar and after a driving run through the heart of the Rovers defence, Baxendale & Walker were on hand to stop him again, repelling the danger. The introduction of Rhys Bloomfield added pace centrally and a neat ball through to Jones saw the wide man use his expressive style of play to evade Thomas Hammond before crossing to Craig Bell, whose goal bound effort was heroically blocked by the lunging McPherson. A neat reverse pass from Wood then setup another Jones opportunity, his centre again met by a group of determined gold shirts, reminiscent of a pack of lions. Wood then majestically took a ball out of the sky to play himself through with his first touch, but the rate at which McMahon sped off his goal line meant the angle was rapidly narrowed, the big keeper successfully diving at the strikers feet. With both teams intent on continuing their quest for a winner, the incident which proved to be the sucker punch arrived when Sherry met Alex Makin’s stray cross from the left - the big centre half, who had played a blinder up to this point, simply sliced a routine clearance, but the repercussions that followed were truly disastrous for the Seasiders - the ball cruelly sent looping high and over Beveridge to the delight of the travelling support. Almost minutes later, Sherry almost made amends at the other end, but after rising to meet Lambert’s corner, McMahon smothered the loose ball as it bounced towards an equaliser with no Rover positioned well enough to prod home. Rothbury’s Brown almost grabbed a stunner via a 25 yard free kick, but the playmaker was left frustrated as it rebounded back off the Rovers crossbar with Beveridge beaten all ends up. A further half chance was then extinguished with tempers then flaring late on - an ill disciplined Sherry given his marching orders for violent conduct with the visitors then effectively seeing the game out for a vital win. Rothbury now find themselves on a 17 match unbeaten league run having earned an impressive nine wins in a row on the road. Spittal had not tasted a league defeat at home since May last year and must now pull together to continue their quest for a top three finish which appears achievable in what is a very open division.